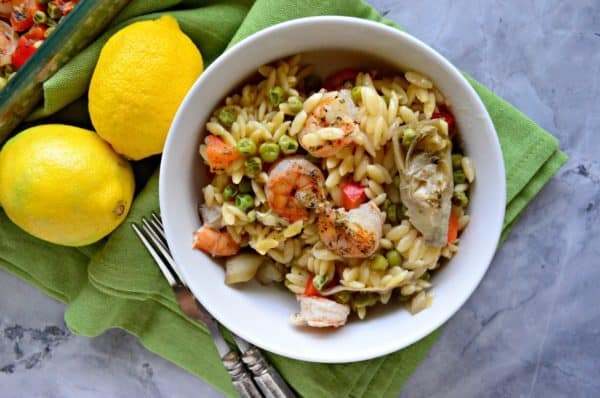 Looking for a simple weeknight meal with minimal dishes to clean? 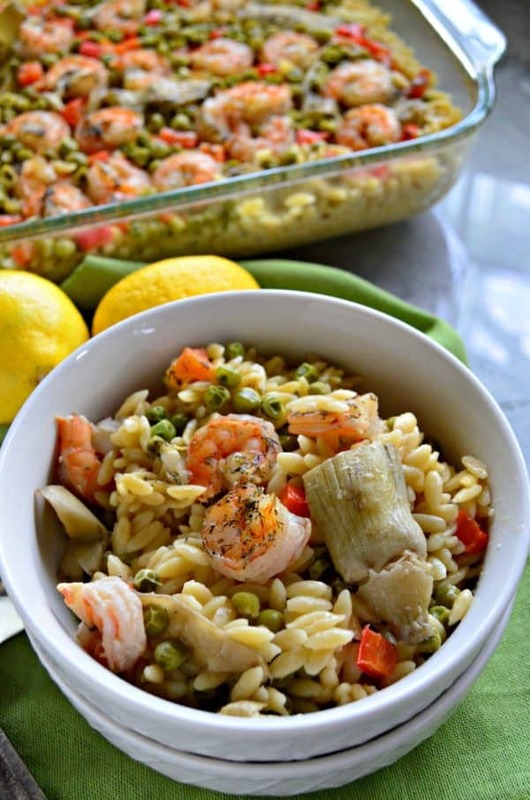 My One Pan Lemon Artichoke & Shrimp Orzo is the ticket. I always keep a bag of frozen shrimp on hand, especially if I find a good sale I’ll pick up a few bags to store in the freezer for a few easy dinners. Shrimp is packed full of protein and can defrost quickly making it my go-to when I’m not 100% sure what I want to make for dinner (or simply don’t feel like cooking). I love a good one-pot pasta meal but as of recently I’ve started moving toward baking one-pan meals for my family. Once the meal is assembled it truly is a set it and forget it type recipe. Let’s talk about the pantry staples: A jar of marinated artichoke hearts is an easy add and a staple I always have in my pantry. 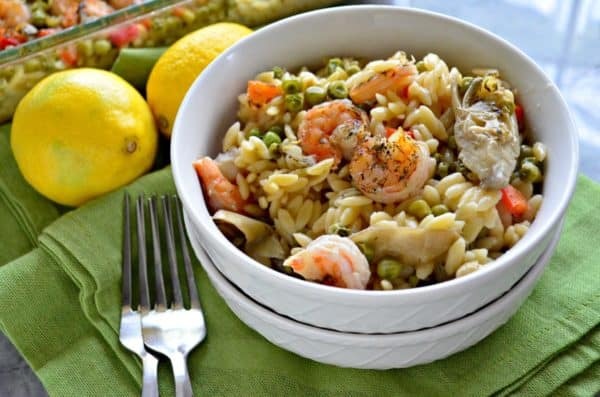 I mainly keep them stocked for salads but for easy pasta dishes like this one as well. You’ll always find chicken stock on hand in my pantry—a good pantry always has a few boxes on hand. You never know when you’ll want to whip up a quick soup or even use it for one pot pasta dishes, mashed potatoes, and more! If you don’t have fresh garlic on hand here are a few tips; I always have squeeze garlic on hand that is stored in the refrigerator and dehydrated in the cabinet. I also always have a bottle of lemon juice in my refrigerator. That way if I don’t have a fresh lemon I can still get the same great flavor but in a bottle. Shhhh no one has to know our secrets. 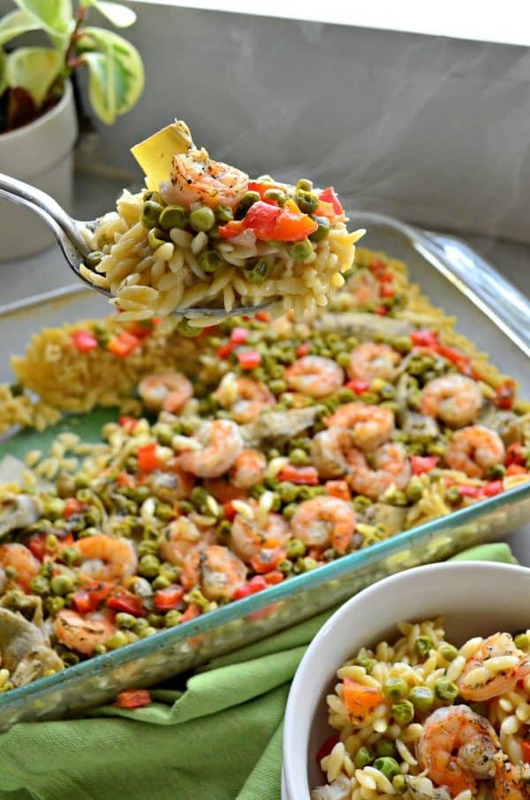 I like using a glass 9 x 13 baking dish for this meal. 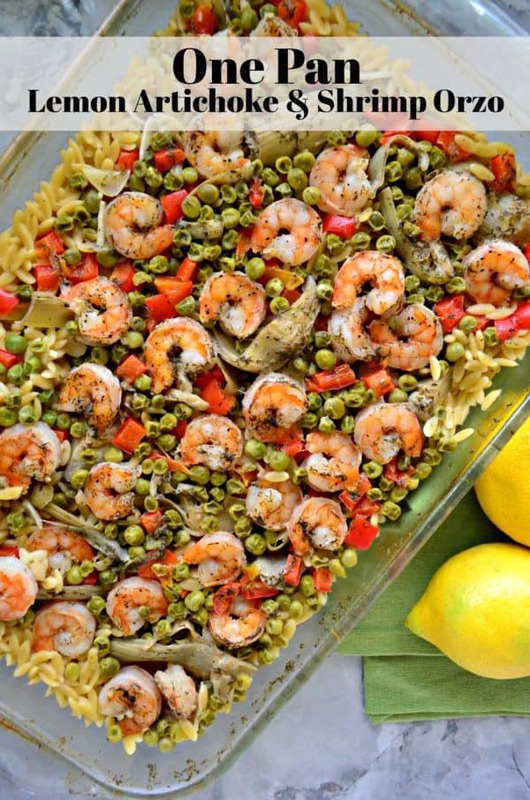 I love that the pasta, veggies, and shrimp all cook together. Very little prep and set it in the oven and I’m under an hour dinner is ready. Covering with tinfoil is key to ensuring the pasta cooks. I like to serve this meal with warm crusty bread and a salad packed full of veggies. Some how we have convinced my picky 3 year old to eat shrimp and now he loves it. We told him the sharks eat it so he thought that was cool and wants to be like the sharks so he eats it. This is actually one of his favorites and if I sprinkle Parmesan cheese on it he will gobble it up. Everyone in my home loves this meal and since creating this recipe months ago I’ve added it to our meal plan rotation! 45 minutes at 450 far too much. Only did 30 minutes and it was starting to burn. something must be a typo? Hi–I have a convection oven, and cooking times can always vary. I’m sorry to hear yours was starting to burn. Can you tell me was your pasta cooked? I just would like to know so I can adjust and add feedback on the recipe. Thank you for taking the time to let me know!